It seems my hand embroidery video tutorials are quite a hit! If you have not checked out my how-to Library of embroidery videos, feel free to take a peek at some of the short videos that demonstrate basic embroidery stitches. For beginners and even beyond, it’s nice to be able to see a stitch as it is worked. If you’ve ever attended an embroidery class, you know how nice it is to get the hang of the stitch while you watch it in progress, rather than having to make heads or tails of written instructions or simple diagrams. You might also know what it’s like to get home and say “Now, how did she do that again?” So this is why I began putting together this little video library of stitches – to help beginners begin and to help other expand their repertoire of stitches. Have you ever tried to hand embroider while hugging an unbalanced and flimsy tripod – with the tripod between you and your work? If you have, you can guess where I’m going! Here’s the little fellow I’ve been working with. 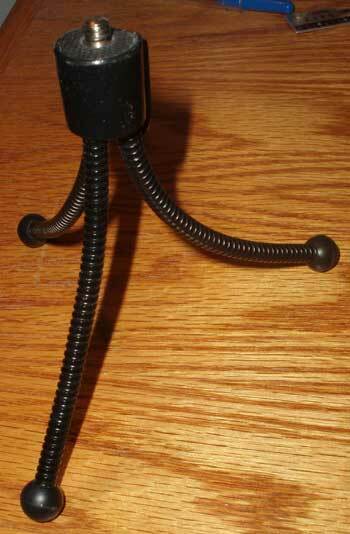 It has bendable legs, stands about 6 inches tall, and works fine for macro stills on the table. But when there’s a lot of movement going on around it, and your arms and hands must pass back and forth here and there, forget it! What I need is something that will allow my camera to rest, floating, just above the frame or hoop, leaving the area between me and my embroidery free, so that my hands can move in a normal fashion and so viewers can get a sense of what it’s like to work a stitch naturally. Today, I ventured out to find The Needful Thing. I was introduced to very nice tripods and optional arm attachments that would allow me to do just exactly what I wanted. The least expensive set up would cost me more than the camera – not to mention that the tripods themselves were rather bulky and looked very exaggerated with my tiny point and shoot attached to them! I know that it doesn’t look like much, especially lying on my bed, but it is a glorious light stand used for photography, with a fully-adjustable-in-every-way-imagineable arm (also for lights), topped with a camera or tripod head, also adjustable. It’s somewhat lightweight (which is fine for my camera), expands and contracts all over the place, and is Just What I Wanted, at the perfect price! Don’t you love to find Just The Thing when you’re looking for it? I certainly do! So now, I can venture back into the filming arena and hopefully, in the near future, you will enjoy the results! Thanks for your patience! I’ll have some up for you soon! I was referred here through today’s Nordic Needle newsletter and just wanted to say “thank you” for creating such a wonderful resource for stitchers. I am new to embroidery and love the videos. Is there any way I can purchase your tutorial videos so that I can refer to them often while stitching various projects? Thank you! Hi, Dottie – the videos are only available online right now, I’m afraid.